Democratic governance is a multi-faceted concept encompassing all aspects of the exercise of authority through formal and informal institutions in the management of the resource endowment of a state. The quality of governance is thus determined by the impact of this exercise of power on the quality of life enjoyed by its citizens. Sustainable development requires professionals with adequate knowledge and competence, well functioning organisations and a conducive legal and institutional framework. Capacity building is a core method to achieve the overall goal of sustainable development. With the current commitment of many governments for democracy and decentralisation, the framework conditions for good governance at the local level are improving. Democratic decentralisation offers opportunities for popular participation, improved accountability, responsiveness and transparency of local leaders, increased effectiveness and efficiency of government services. It can contribute to the poverty reduction efforts of the respective countries as it provides chances for empowerment, resource mobilisation and the provision of those basic services which are to alleviate many of the causes of poverty. Effective local governance based on democratic and good governance standards, however, requires not only improvements in performance of local governments, but also their effective interplay with civil society, the private sector and national government institutions. 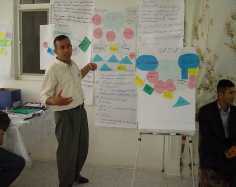 The capacity building approach as described here comprises of a broad set of interventions which promotes the development of competent, responsive and accountable (local self-) government institutions, the establishment of mechanisms by which different population groups can equally participate in local decision-making processes and the evolution of civil society players and organisations. These in turn lobby and advocate in the interests of citizens, empower disadvantaged groups of society, as well as develop and apply the necessary checks and balances towards their elected representatives. It targets individuals, organisations, the interplay of organisations and the overall institutional framework based on a comprehensive contextual analysis.